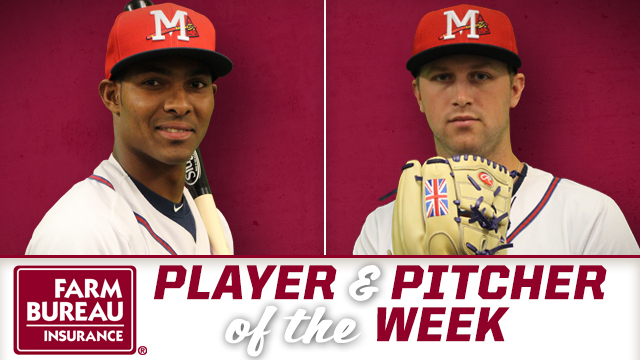 PEARL, MS -- Infielder Carlos Franco and RHP Max Povse have been named Mississippi Farm Bureau Player and Pitcher of the Week for the week ending Sunday, August 8. Franco hit .500 (10-for20) and posted a .800 slugging percentage in seven games during the week. He had three doubles, a homer and seven RBI. Franco's average was the second-best in all of Double-A baseball during the week. A native of the Dominican Republic, Franco is hitting .260 through 98 games with the M-Braves this season. He has 11 doubles, three triples, three homers and 42 RBI. Franco was signed by the Braves as a non-drafted free agent on May 5, 2009. Povse, 22, made one start and held the BayBears to just one earned run (a homer) on three hits Friday night. In six starts for the Double-A club, he's posted a 4-0 record with a 2.65 ERA. Prior to joining the M-Braves in early July, Povse was 5-5 with a 3.71 ERA in 15 starts for the Mudcats this season. He posted his best numbers during the month of April when he went 2-1 with a 1.69 ERA in four starts. Right-handers are hitting just .210 against Povse. A native of North Carolina, Povse was selected by the Braves in the third round of the 2014 draft out of UNC Greensboro.